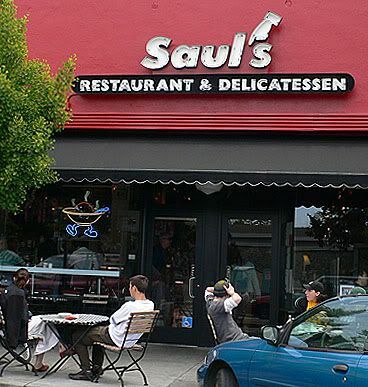 We came here at the urging of my FIL Don, who found Saul’s Deli some years back when he was browsing the many interesting stores in the vicinity. 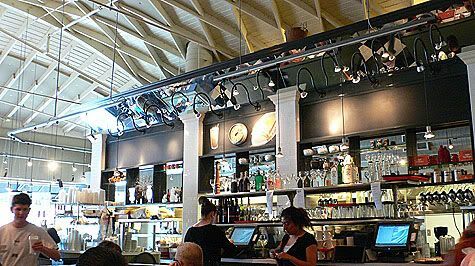 He said they had the best potato salad and was very keen on going back for more. 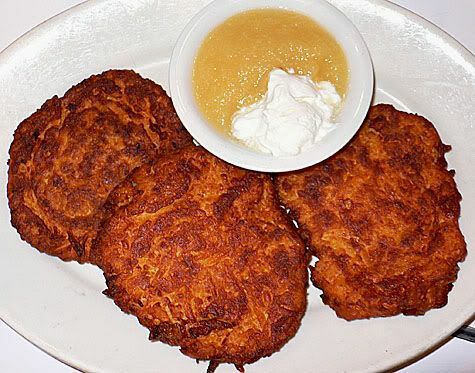 Our server recommended Potato Latkes to start off. These were three fried, seasoned, grated potatoes & onions, served with apple sauce and sour cream. 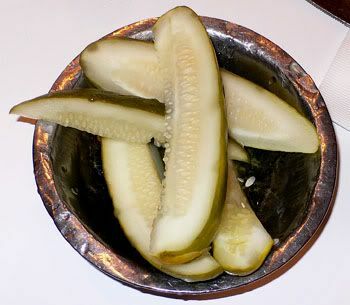 The outer crust was very crunchy and crisp with a tender and savory interior. Very good with an extra blob of the spicy brown mustard provided on the table. Mank went with the soup and salad. 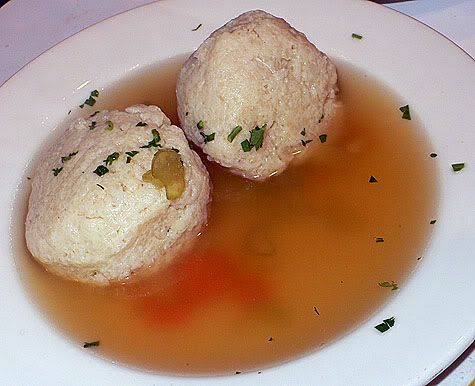 He had Matzo Ball Soup which were two orbs of tender and creamy matzo floating in rich and flavorful chicken soup. And his Caesar Salad had delicious big crunchy croutons liberally dosed with garlic and olive oil. 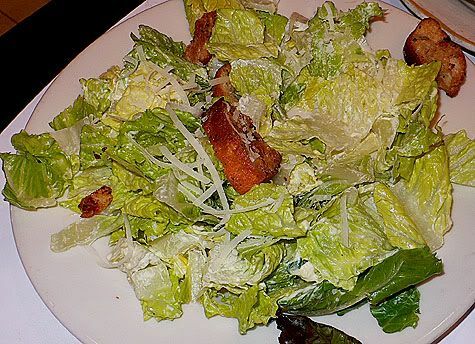 The dressing was light and unremarkable, and they used hearts of romaine for the lettuce. 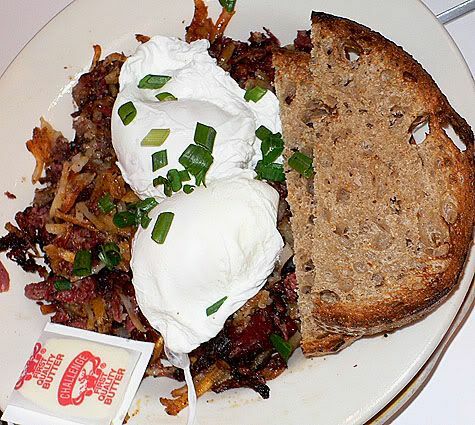 DR had the Corn Beef Hash from the breakfast menu, which had two poached eggs poised on top. 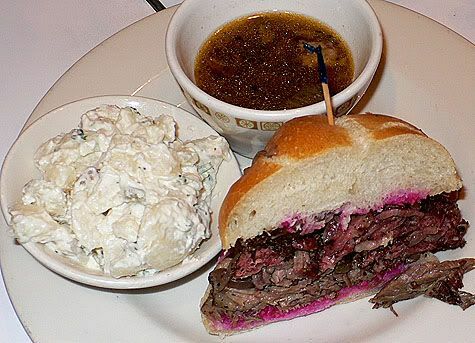 Mr. K and I split the Kvetchen Maven which is Pastrami and Brisket on a Kaiser Roll and served with a green salad. 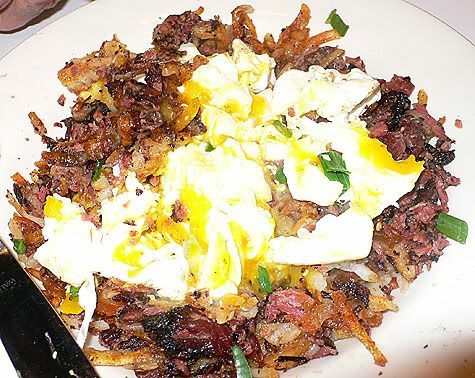 The pastrami is brine cured Niman Ranch beef from the belly and it is fabulous. 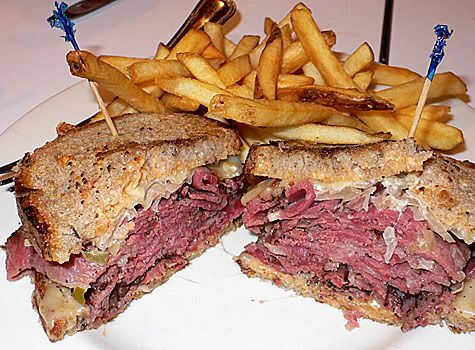 I have never had such tender succulent pastrami and it is cut a little thicker than normal, which showcases the wonderful texture of the meat. 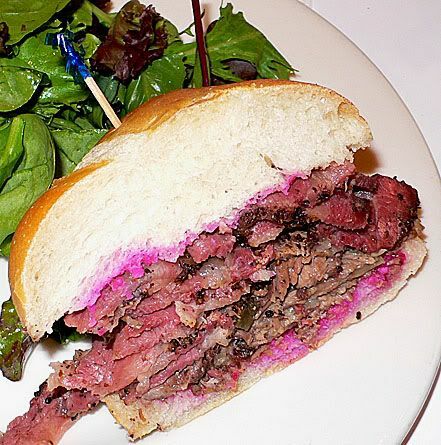 It has a bright magenta spread that is probably made from pickled beets and horseradish and adds a brilliant pink tint to the sandwich. We also split an order of the potato salad that DR raved about, with good reason. It’s rich, full flavored and zesty – a perfectly balanced potato salad, we all highly recommend it! CDR had a Reuben plate, which is a huge pile of the luscious pastrami with russian dressing and sauerkraut on rye with fries. DR said he might try to make it over there one more time before he leaves town next Weds… that in itself is testament to how good that potato salad really is… and I might venture to put this into the category of food shrine.